Combine the chocolate and shortening in a small saucepan. Heat over medium low heat until melted, stirring until smooth. Remove from heat. Dip half of one starfruit slice into dark chocolate until coated, allowing the excess chocolate to drip back into the pan. Place on a wax paper lined baking sheet. 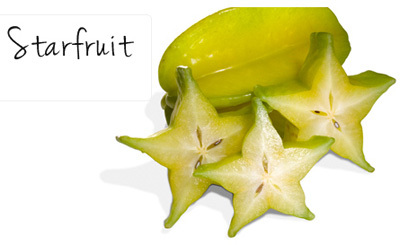 Repeat with the remaining starfruit and chocolate. Chill the fruit in the refrigerator for about 30 minutes, or until chocolate is set. Serve the same day. Suggestion: Use white baking chocolate instead of dark chocolate for dipping. Save $1.50 on ONE (1) Huggies® Little Swimmers® Disposable Swimpants package (10 ct. or larger).